Zinio is an online magazine subscription company which offers thousands of best-selling magazines﻿ from around the globe. The good thing about this is that you can browse and purchase subscriptions or single issues instantly from your laptop or desktop as well as gadgets like the iPhone, iPod, Android mobile phones and tablets, and Kindle Fire! It's really convenient because the magazines can be read wherever and whenever you like, without having to remember to tote your magazine around. Readers can easily browse, purchase and instantly read the digital magazine of their choice. Readers can also search and move seamlessly within each publication page between text, interactive graphics, animated illustrations, videos and much more. Readers are also able to continue their read from any of their devices; and since each issue is saved, you only purchase it once and can go back and read it again at any time. There is also an Explore section where readers can preview magazines and read for free thousands of articles from your favourite magazines, and then share them with friends. There are many other magazines available besides the ones I've shown pictures of so do go check Zinio out. Get US$7.50 off after spending US$15 on any magazine subscription. Hurry- offer ends March 15th 2013! Click HERE to start browsing through magazine titles. Also, you can get up to 50% off on selected titles. Offer ends March 19th 2013. Click HERE to head on over to Zinio! Okay, so on to the giveaway! I have been given 10 free digital magazine subscriptions to give away as a way not only to spread the word about Zinio, but also to say thank you to all of you for your support and interest in my blog. I have been given the option to keep one of the subscriptions for myself and I have decided to do so, hence I will be giving away 9 free digital magazine subscriptions to all of you. The magazine subscriptions are either a 6-months or 12-months subscription, depending on the magazine you choose. This giveaway will run until March 25th 2013 11:59PM UTC +00:00/ GMT and 9 winners will be chosen randomly. There will be mandatory entries (you have to complete the mandatory entries which are Name, Email, and Blog Post Comment about Which Magazine Title you want to Win) as well as additional entries to increase your chances of winning, so do ensure you look at all the options listed in the Rafflecopter below. 2. All entries must be received via the Rafflecopter giveaway widget. 4. Please complete the first three mandatory entries (NAME, EMAIL and BLOG POST COMMENT) in the giveaway in order to stand a chance to win. The later entries are optional. 5. This giveaway ends March 25th 2013 11:59PM UTC +00:00/GMT. 6. If you are below 16, please ask your parents for permission before entering this giveaway. 7. 9 winners will be selected at random on March 25th 2013 and will be contacted by email. 8. The winners will be contacted within 48 hours of the announcement of the winners and have 48 hours to reply. If the winners do not reply after those 48 hours, a replacement winner will be chosen. This process will be repeated until 9 winners have been chosen and contacted successfully. 9. Prizes are supplied by Zinio and will be supplied to winners by said company. 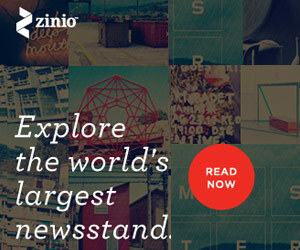 If you would like to browse through the oh-so-many magazine titles of Zinio, click HERE. DISCLAIMER: The 10 free digital magazine subscriptions were provided by Zinio for the purposes of this giveaway. I am not paid to write this post or to host this giveaway, but I am compensated by claiming 1 of the 10 magazine subscriptions. The other 9 are for my lovely readers to win! However, this does not in any way affect my views in this post. Everything written are my honest opinions and are not biased towards or against Zinio. I would like to win National Enquirer.